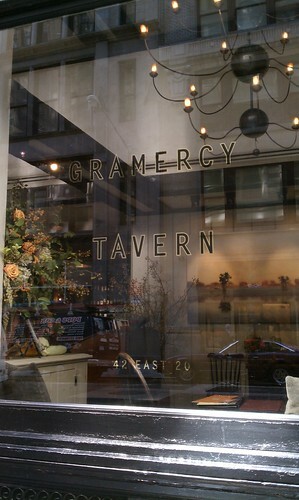 I decided to have a relaxing lunch at Gramercy Tavern during a personal day I had taken to help out my grandparents in Brooklyn with errands. I've been meaning to make a stop here for the longest time ever since Derek had told me about it a few years ago, so I'm glad I finally made time for it (even if it was dinner that I had originally thought about). For the longest time, it used to be so awkward for me to say to the mâitre d', "Table for one, please." I had gotten over it around the time I traveled to Hong Kong for an internship where it was just me, solo, for four weeks. There was no way that I was going to miss out on all of the gastronomic goodness that Hong Kong had to offer, so I had a lot of practice during those four weeks of eating alone. 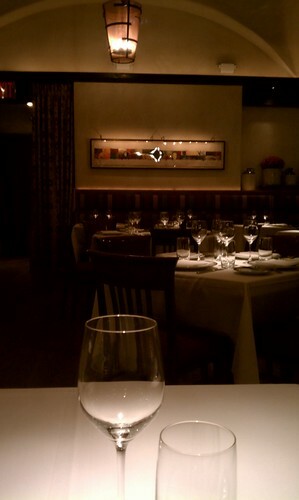 View from my "table for one" at Gramercy Tavern. I probably should've eaten in the bar area of the dining room, where it was less dark and intimate, but before I could say anything, the mâitre d' had already walked me to my table. Oh well. The interior was filled with old American antiques (very tavern-esque) and lit by glowing candles and copper sconces (seen in photo above). Butter and sea salt accompanied the bread that afternoon. 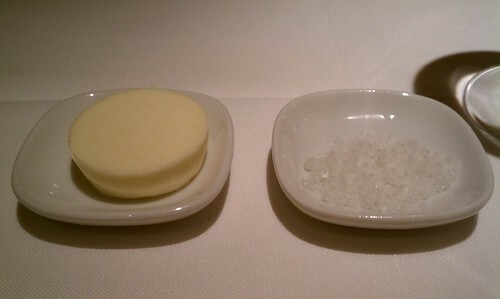 I found this to be a really great combination--I had never been to a restaurant that served butter with salt before! Why have salted butter when you can have creamy, unsalted butter with some sea salt sprinkled on top? Yum! 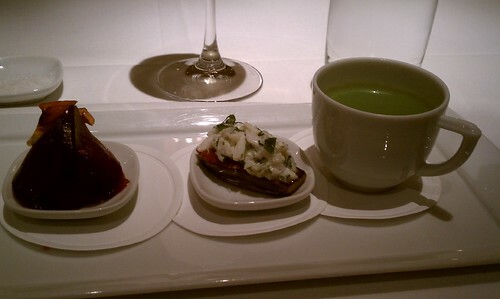 The restaurant started out my two-course lunch with a series of the three amuse-bouches. The first was a beet and watermelon salad with hazelnuts and blue cheese, followed by a fairytale eggplant with some kind of confit (I missed that part) and crab salad, ending with a chilled pea soup. Beets, eggplant, and chilled soups aren't really my thing, but I promised myself, upon starting this blog, that I'd be more open to trying new things as well as old things that I've always found to be "ehhh" or repulsive. The first salad was pretty edible, except I thought it was slightly drowned too much by the beets. The crab salad was great. I tried a little with the fairytale eggplant (how cute, right?! ), and I still wasn't feeling the combination. The chilled soup wasn't horrible, but I'm still a firm believer that soups should be served hot. 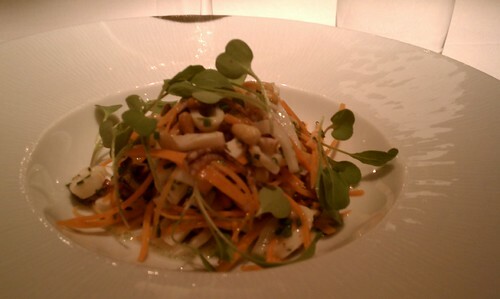 As my appetizer, I started with a calamari and carrot salad with toasted pine nuts and preserved lemon vinaigrette. I can't say this loudly enough--this was AMAZING! The combination of moistness (carrots), a dry crunch (toasted pine nuts), freshness (lemon from vinaigrette) and tender texture (calamari) made for salad so reminiscent of summer flavors. It was so subtle that it was easy to eat. Come to think of it, I finished really quickly. If I ever want to make a salad for a party or for lunch--this would be something that I would love to try to re-create. Solid success if executed properly! 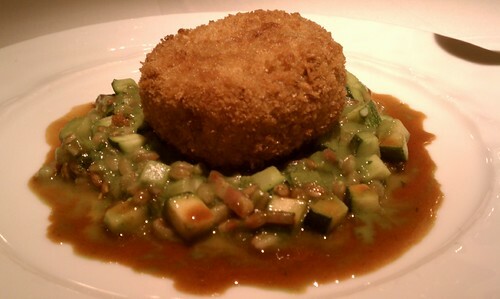 I ordered the pork croquette with summer squash and farro. I guess during the time of my visit, fall was still coming around the corner, so it was nice to see the last remnants of summer ingredients in this dish as well as the salad. The bed of summer squash and farro was nicely done--the sauce may have been slightly much, but it worked well with the crispy outer shell of the pork croquette, which was battered very lightly. The pork interior was delicious, too. There may have been a little too much pork, and not enough outer shell, for the ratio of vegetable-grain-protein-batter to be optimized at its best. 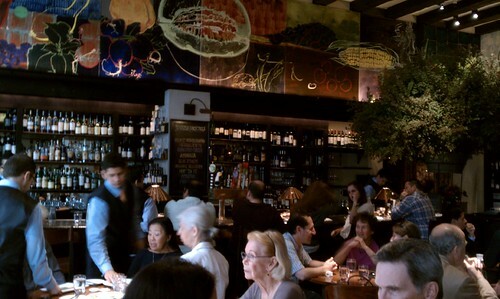 "Tavern" area of the restaurant. I like that there's a lot of natural light coming in from the windows here--it would make for nicely lit photographs. Price point: $14 for appetizer; $18 for entrée.